Whether you’re just getting started creating your online store or have successfully built up a sustainable e-commerce business, you can always improve the ways that you’re communicating with your customers. Research shows that consumers interact, engage, and spend more with brands with savvy cross-channel marketing strategies. By personalizing your campaigns with highly relevant messaging, you can successfully serve your customers throughout their lifecycle. That’s why we’re pleased to announce our newest integration with the leading e-commerce platform, Shopify! 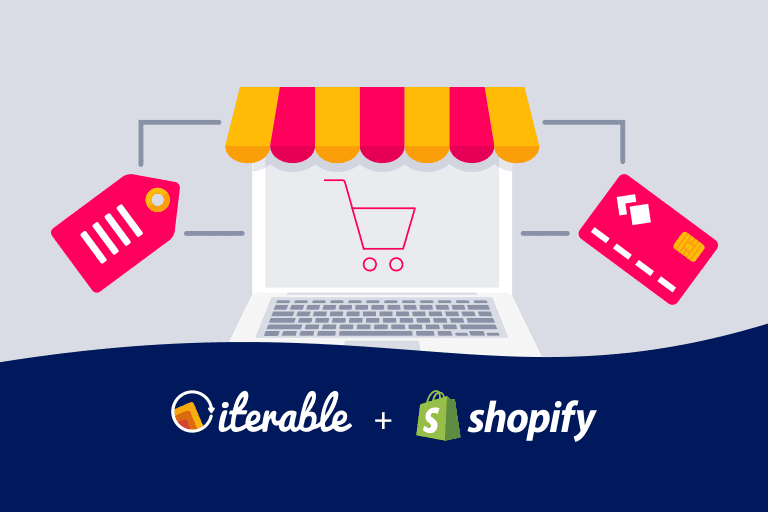 Iterable now offers a native integration with Shopify, enabling businesses of all sizes to automate cross-channel marketing campaigns based on shopping behavior derived from their Shopify e-commerce website. Implementation is as easy as dropping the Iterable API key into the Iterable Shopify app, making it simple to achieve significant boosts in customer retention and ROI. Shopify is an e-commerce platform designed to help brands—startups and market leaders alike—power their online business. Shopify offers e-tailers many benefits, including website development, customer billing, online inventory tracking, mobile commerce, and selling on online marketplaces like eBay and Amazon. With over 1M active users and $82B sold on the platform, Shopify has become a household name and an integral ingredient of success for many brands all over the world. However, in today’s Now Economy, it’s not enough to set up your online store and wait for the transactions to roll in. In order to create recurring revenue for your brand, you need a sophisticated marketing platform like Iterable that can segment your audiences, personalize your communications, and act on behavioral data to maximize engagement and revenue. Who Will Benefit From the Shopify + Iterable Integration? E-commerce brands can now unlock the power of Shopify within Iterable’s growth marketing platform. With this new integration, marketers can send personalized messages and build seamless cross-channel campaigns that include an unlimited amount of historical purchase data from Shopify. The Iterable Shopify app removes any heavy lifting from the merchant’s engineering team and allows the marketing team to get up and running quickly. To get started, you only have to enter your email address and API key from Iterable and place it directly in the app. 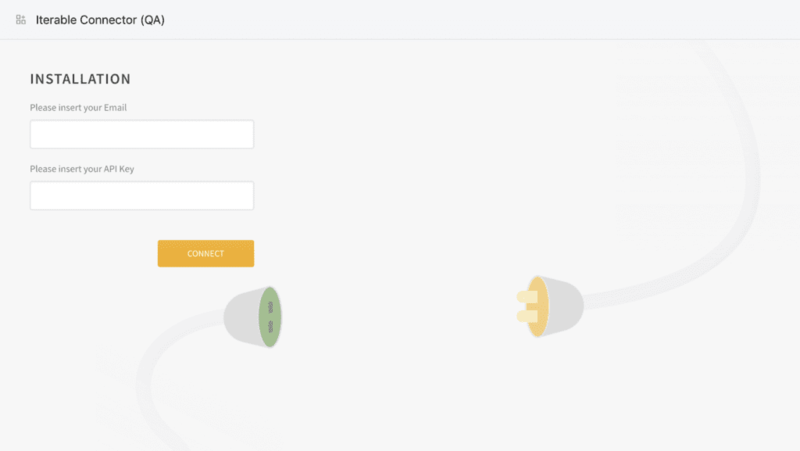 Installation is easy—just enter your email address and Iterable API key to connect to the Iterable Shopify app. What Can We Expect From the Shopify + Iterable Integration? 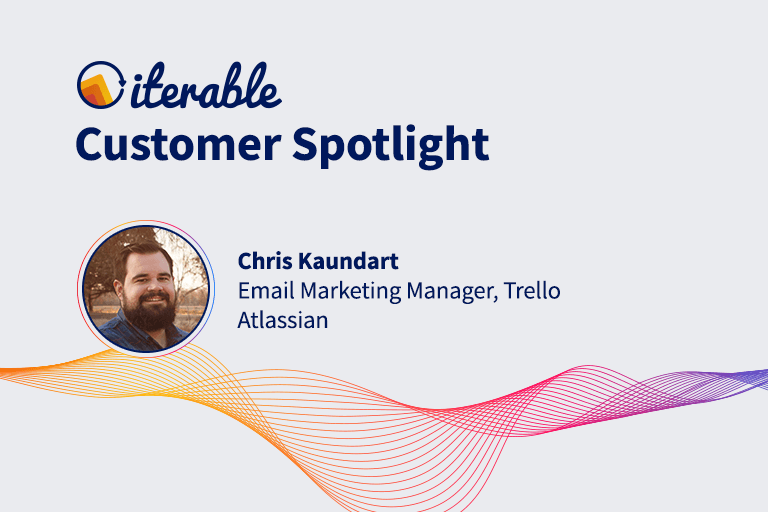 From sending triggered cart abandonment emails to building personalized post-purchase workflows, Iterable’s integration with Shopify is instrumental in increasing customer engagement and revenue. 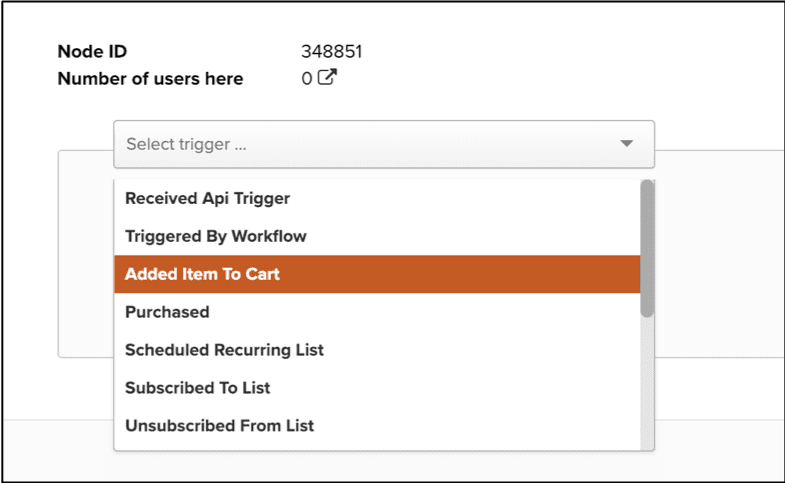 In the example below, you can easily set up a cart abandonment campaign in Iterable’s Workflow Studio by selecting the trigger type, “Added Item to Cart,” for the start node. Launch your cart abandonment campaign by selecting the appropriate trigger type in Iterable’s Workflow Studio. After selecting the trigger type, you can create Send, Filter, and Delay nodes in Workflow Studio using Shopify data. As seen below, we have created a Send node to send an email once a user adds an item to their cart. The message you send can be personalized based on the type of e-commerce event that occurs. 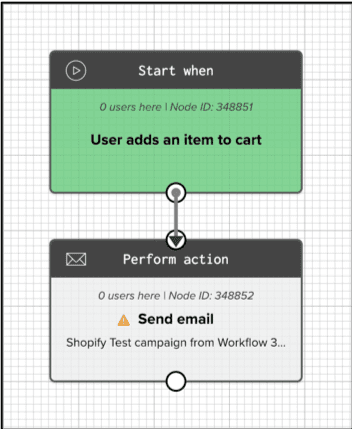 Add a Send node to your campaign to deploy an email once a customer has added an item to their cart. Browse Abandonment for shoppers who have browsed items online, but have not placed any in their shopping cart. Cart Abandonment for shoppers who have placed items in their shopping cart, whether on desktop or mobile, but have not completed checkout. 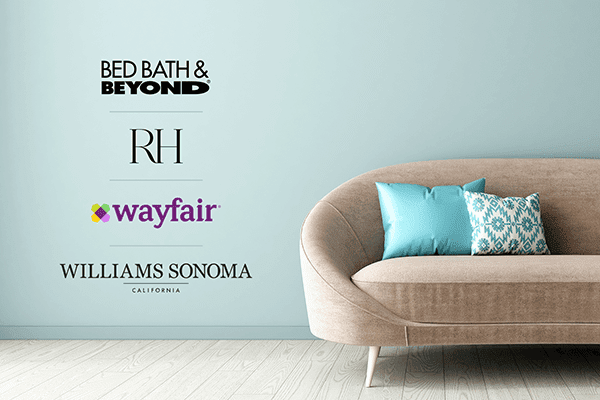 Post-Purchase Workflows to entice recent buyers to return, offering special promotions to drive more business. What Makes the Iterable + Shopify Integration so Powerful? To learn more about Iterable’s integration with Shopify and how brands are leveraging it today, register for our upcoming webinar with Lovepop, the brand that’s disrupting the greeting card industry. 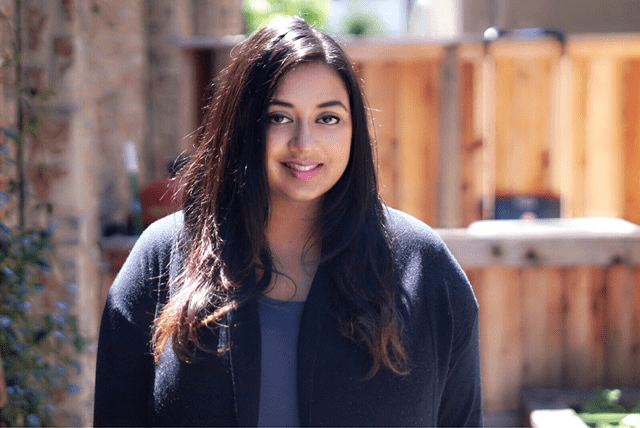 Christine O’Brien, Retention Marketing Manager at Lovepop, will cover best practices for delivering personalized content through our Shopify integration so that you can walk away with tangible steps to immediately increase the value and impact of your marketing communications. Register now for the webinar, because you won’t want to miss these advanced personalization tips!